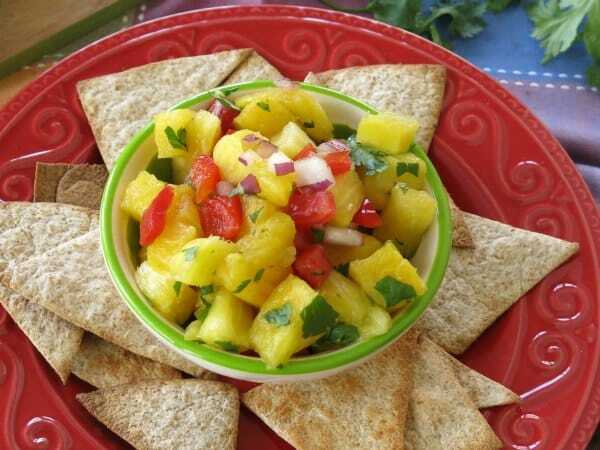 This Easy Pineapple Salsa Recipe is the perfect topping for grilled chicken, fish tacos or scooping with your favorite chips! Just add all the ingredients to a bowl and let the magic begin. Since this recipe shares several ingredients (red onion, tomatoes, and cilantro) with Simple Guacamole Dip, I often make both recipes at the same time. It’s best to eat the guacamole fairly quickly so it won’t turn brown. 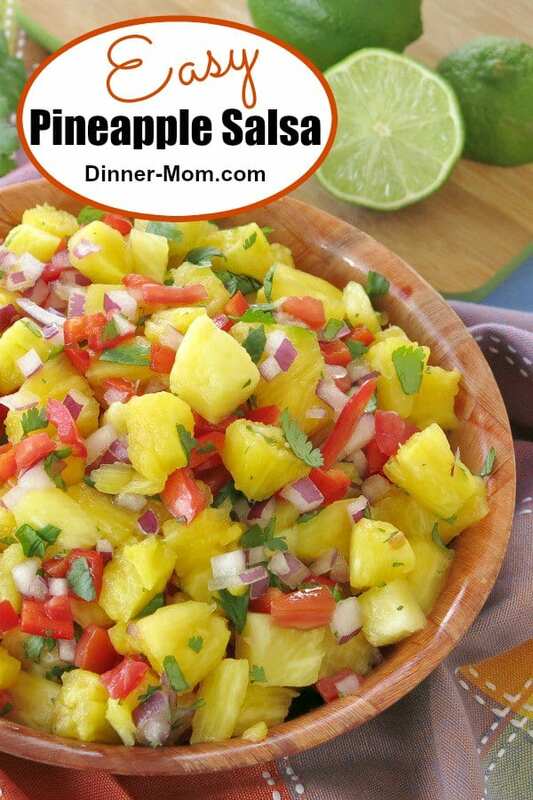 But pineapple salsa gets better while it sits, as in make extra for the next day! Spoon it over Baked Lemon Pepper Chicken or Lemony Baked Basa. It’s a healthy and festive way to dress up dinner too! Plan ahead and set some aside. Otherwise, it will definitely disappear! Prepare the following ingredients and mix them together in a bowl. That’s it! Dice Pineapple – we buy pineapple with the outer skin removed and dice the rings. Check out How to Cut a Pineapple to prepare a whole one. Use canned pineapple chunks in the off-season. Dice Red Onion – the red variety has a mild flavor and just happens to add a bit of purple color too. Remove seeds and dice Plum Tomatoes – my favorite tomato because it’s so easy to prep. Dice Red Pepper – the sweetest of the peppers. Chop Cilantro – pull clean cilantro leaves from stem and place them in a small container. Use scissors to snip. Salsa is one of those recipes where the ingredients and amounts can easily be adjusted to taste. For example, I often leave out the red pepper and add extra tomato instead. We add a squeeze of fresh lime juice to get things started, but you don’t have to. The juice from the pineapple will blend the ingredients together over time. 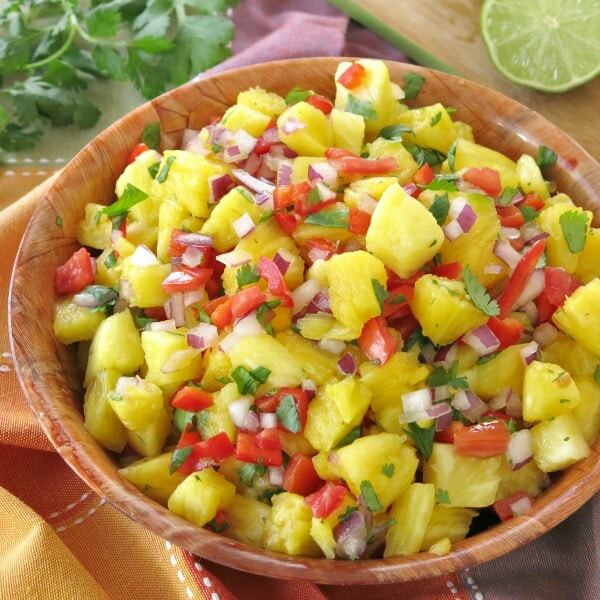 Allow the mixture to sit for about 15 minutes for the very best pineapple salsa. What goes with Pineapple Salsa? Top baked or grilled chicken, fish or pork before or after cooking. Add it to fish tacos. Mix it into a Mexican or tropical rice bowl. 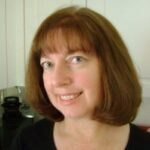 It shares ingredients with Fresh Corn and Black Bean Salsa. Mix these two recipes together for a tropical explosion! Please rate this recipe and tag @DinnerMom or #DinnerMom on social media if you make it! We love to see what you are cooking up! This Easy Pineapple Salsa Recipe is the perfect topping for chicken, fish tacos or scooping with your favorite chips! Just add all the ingredients to a bowl and let the magic begin. Combine all of the ingredients in a large bowl. Allow ingredients to rest in the refrigerator for about 15 minutes. I can think of a lot of different dishes that would be great with this salsa. Sometimes a sweeter salsa is perfect with pork and I have a fish recipe that the salsa would really enhance. 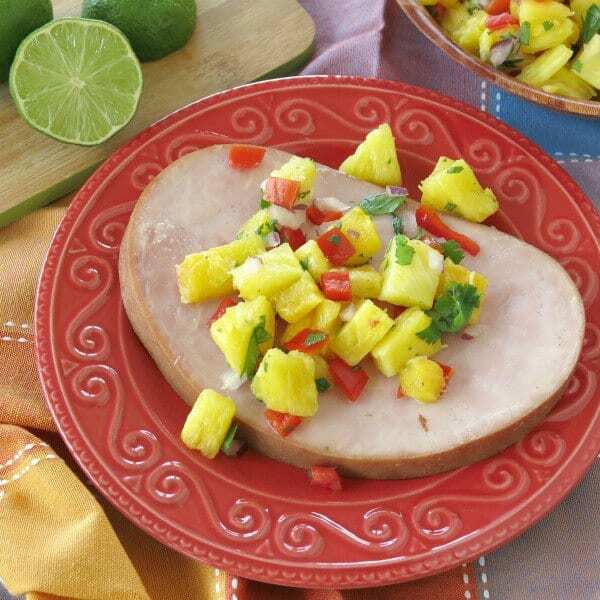 Pineapple and pork is so tasty together! I’m thinking about adding it to a pork tenderloin in a slow cooker. This looks INCREDIBLE. Can’t wait to eat it all up. I’m so glad you like it! Thanks for your comment!